As publisher of Natural Awakenings Long Island magazine, each month Kelly Martinsen writes a letter to readers that sets the tone of that issue's unique editorial theme. Four years ago, within two days of publishing her first letter, 'You Only Regret the Things You Don't Do,' a reader called to thank her for the thought-provoking piece that spoke deeply to her. Month after month, topic after topic, responses to Martinsen's editorial letters grew and readers were connecting with her words in life-changing ways. A Year of Inspired Living is a monthly chapter book with weekly sub-chapters, compiling and expanding on Martinsen's letters leaving the last page of each week for the reader to write their own letter. Chapter topics include: love, commitment, faith, challenges, death, freedom, middle age, children, cancer, dog poop and more. Written in a familiar voice, A Year of Inspired Living speaks with wisdom, tongue-in-cheek self-effacing humor, and raw honesty to help readers reach into the hidden corners of their lives and develop a greater awareness of their own personal relationships and journeys. To help them reap the maximum benefit of their experiences, a reflection question and blank page follows each weekly entry, guiding and inspiring them to record their own life-story. I need your help. I can't seem to finish this book. You see, while I was writing Iit seemed that every time I would come to the end of a chapter I would think, I, but I just didn't know what it was. Suddenly it hit me. Perhaps I am not meant to finish this book. Maybe—stay with me a minute—I I finish this book. This is not because I am lazy, have writer's block, or because I am amazing at the art of procrastination. Nope (although all of that is true) that is not it. I think I am not able to finish this book because I am not meant to. YOU are! This is not just a book, it is a very specific personal, yearlong exercise created to help you live your most inspired year. Truth is, I can't write a book that tells you how to publish your life. It is that simple. I put the magazine together and allow it to proclaim publicly, through articles, images, and a great cover, the idea of feeling good, living simply, and laughing more. When I publish a magazine I put it all together and I write notes all over the draft. When the magazine is near completion for the month, I look at it and I contemplate it. Is it ready to publish in accordance with the mission? If so, I do the final act of writing a letter to the readers. It is called the 'Letter from the Publisher' (and it is always on the first page). The letter is based on inspiration I have gleaned from the monthly articles and images and is designed to offer the readers a way to read the magazine. It tells them what articles inspire me, what images challenge me, and it hopes that the readers are inspired to maybe alter just one area of their life in that month. Aren't you the publisher of your life? Our clothes, hair color and style; the words we choose; sports we play; diets we try; the Botox that we get or don't get (admit or don't admit)—it is all part of our personal publishing. These choices are our way of proclaiming publicly who we are. You are the publisher of your life! So wouldn't it be nice this year to solidify, via a guided writing format, your own 'Letter from the Publisher'? At the end of each week there is an area for journaling and self-reflection, but I wanted even more participation from you. I wanted this book to be self-inspiring, so I left the last week open for you, the reader, to write your own 'Letter from the Publisher.' As the 'publisher' it is you who ultimately decides what anger you hold, what relationships you nurture, what risks you take, what wine you drink, what food you eat, what friends you keep, what God you worship, and how your life should look and feel. Share these letters, or keep them private, but engage and map out your life month by month with amazing intentions the same way a publisher maps out her magazine. Simply put, this is a letter written to yourself that helps you to locate the things you may be searching for. It can bring to you a hearty sense of self-realization, and reveal the attributes within you that you didn't even know you possessed. This letter outlines and reminds you how you want to represent yourself, both internally and externally. I've learned this is a powerful process. I've discovered so much about myself writing my monthly publisher letters. I discovered things I love (my wrinkles . . . could you imagine? ); things I hated (muffin top . . . seriously, find me the person who is evolved enough to embrace that); things I was fearful about doing (surfing, parenting); and things I wanted more of (love, God, purpose). I hope that writing these letters and journaling your reflections brings you the same joy and profound self-discovery that it brought me. If not, well then I hope you laugh at some of my silliness, cry at some of my sadness, and ultimately feel that you had a nice time sharing a confidence with a good friend. At the end of each monthly letter that I write for the magazine, I always sign off with Malama Pono, which means 'take care of you' in Hawaiian. That is the goal of every letter I write. That we all always take care of ourselves: mind, body, and spirit. That we feel good, live simply, and laugh more. So embark on this journey and this year, more than ever before . . .
©2017 Kelly Martinsen. All rights reserved. 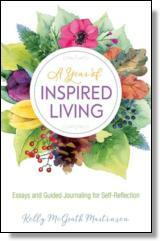 Reprinted from A Year of Inspired Living: Essays and Guided Journaling for Self-Reflection. No part of this publication may be reproduced, stored in a retrieval system or transmitted in any form or by any means, without the written permission of the publisher. Publisher: Health Communications, Inc., 3201 SW 15th Street, Deerfield Beach, FL 33442. Kelly Martinsen (Long Beach, New York) is the publisher of Natural Awakenings Long Island, which is part of the larger family of Natural Awakenings Magazine (circulation 4.2 million). Natural Awakenings Long Island is read by over 55,000 people and is the exclusive free magazine distributed at Whole Foods Jericho and distributed to other healthy-living establishments on Long Island; she has made many connections in the wellness and inspiration world and has gleaned pearls of wisdom from all of them. Martinsen has just begun to extrapolate on the overwhelming response to her editorial letters and hopes to write more books that focus on the process of delving deeper into living an evolving life, raising conscious children, and applying the power of faith.